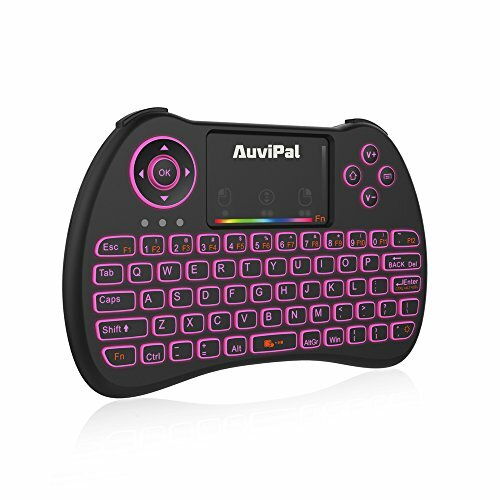 AuviPal R9 mini wireless keyboard is time saver for Amazon Fire TV Stick (2nd Gen), Roku Streaming Stick, Android TV KODI Box and More! The touchpad supports multi-finger functions. A single finger click as left mouse function, two-finger click as the right mouse function, double finger drag as the rolling screen. Easily browse the internet and play games. Open the battery cover of R9 keyboard and take out the USB dongle, insert it to the devices with a standard USB interface. Once connected, slide the power switch to the "ON" position located on the left slide of the unit to establish the connection. The device with built-in lithium-ion battery, Fully charge the unit before operating for the first time, this device can be used when charging. but will extend the charging time. When the battery is low, the low-voltage light will flash to warn the user, the unit will automatically turn off if the battery has been depleted. ✅ Simple to set it up - Connect Amazon Fire TV Stick (2nd Gen) to 2 in 1 USB cable, Plug the USB dongle of R9 keyboard into the USB adapter. no extra effort or configuration needed, Plug and play. Note: 2 in 1 USB cable is specially design for firestick which Supports OTG function - Saves your money by eliminating the need for buying extra components. ✅ Time saver for Amazon Fire TV Stick (2nd Gen) , especially for KODI media player application. The speed of typing on R9 mini keyboard is about 10 times faster than typing on previous remote. AuviPal R9 mini wireless keyboard makes the navigation of your devices more easier and faster. ✅ Simply but all-round: Added two new R/L buttons to the front of the keyboard and Reduced 21 needless keys compared to the old models. Go R9 wireless keyboard, no more pointing and clicking. ✅ Adjustable Function - R9 mini keyboard has over 180,000 backlit colors available and four backlit models, Powerful features allow you to have more choices to enjoy your leisure time. Luminosity of each backlit colors is adjustable. ✅ Wide Compatibility - Compatible with Amazon Fire TV Stick (2nd Gen), Nvidia Shield and Android TV box KODI Media Player Application, including Raspberry Pi, PC, Xbox 360, PS 3 and more.